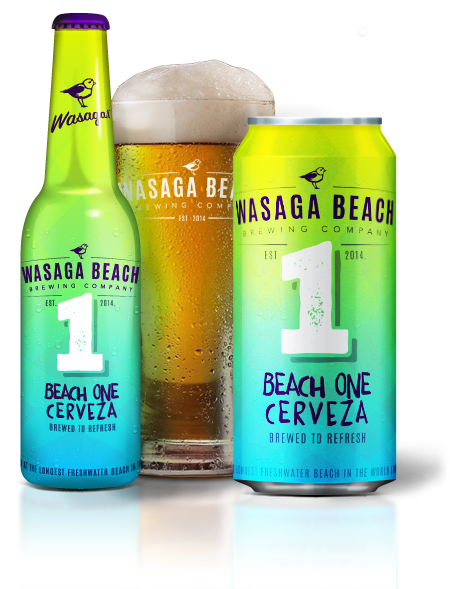 WASAGA BEACH BREWING COMPANY is about sand in your toes and rock and roll on the radio. We’re located at the shores of the longest freshwater beach in the world (87,500 beer cans long), where, for generations, Canadians have left behind the daily grind to seek sun and fun. We put a bit of that in every beer we brew. * that's how we say Cheers! around here! The rare Piping Plover returns to Wasaga Beach each spring and a million people follow – for the sun, the sand, and the scene. Male Plovers will strut up and down Beach One to attract mates; male humans have been known to do the same. Up here, the Plover’s our bird and this is our beer. Beach 1 is the strip at Wasaga Beach where sun and sand lovers cruise to see and be seen. When it gets a little hot, grab a Beach 1 Cerveza. Beach 1 cerveza is the perfect summer beer and it’s pretty darn tasty in fall, winter and spring too. Whatever season you’re celebrating, this crisp and refreshing thirst-quencher is best shared with friends and served cold with a lime to intensify the flavour. Beer lover? It's smooth, crisp and refreshing. Connoisseur? It’s a smooth light beer with pleasant malt and hop notes and a round dry finish.